Secluded Boutique Hotel in Playas del Coco with a la Carte Meals Included. Have a romantic getaway with your partner or a luxurious stay with your friends. Enjoy this adult-only destinationnear the beach. Villa Buena Onda is a luxury hotel in Guanacaste, located close to the Papagayo Bay. Villa Buena Onda is Costa Rica’s finest adult-only, boutique hotel, with personalized service that goes above and beyond expectations. The spacious and elegant suites offer both full and partial ocean views over the Pacific. The 10,000-square-foot villa sits on 1.24 acres of tropical landscaped property, making it perfect for a great vacation offering luxury and privacy. The hotel’s exclusive brand of first-class, personal service will ensure you won’t have to lift a finger. All you have to do is relax and enjoy your time in paradise. Choose a spot to lounge around the pool, at the bar, or on your private balcony or patio and enjoy the steady, gentle breeze. Take in the unobstructed view of the ocean and islands in the distance and the tropical birds flying around the surrounding trees. Situated just one mile away from ‘Coconut Beach’, you can enjoy a feeling of seclusion while at the villa, but you are close to the action, right in the center of some of the country’s main tourist attractions. You can enjoy the convenience of adventure, nature, and relaxation, all within a short distance. For a more relaxing experience, be sure to visit the recently remodeled Secreto Spa. This peaceful oasis is tucked away from the main hotel and provides an elegant setting where you can enjoy from a list of stress-melting treatments. 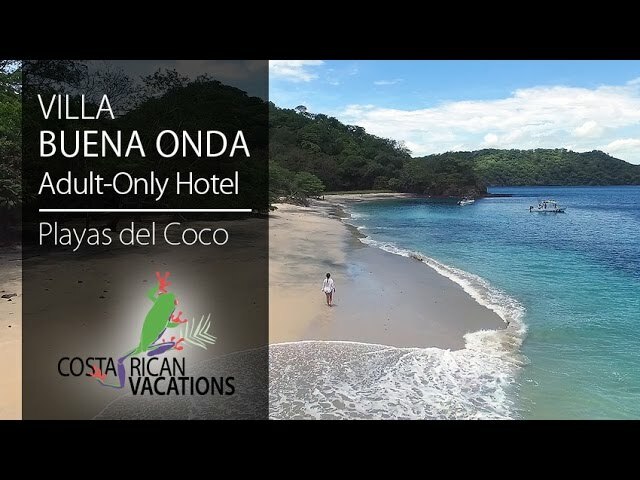 In addition, Villa Buena Onda guests can enjoy free access to the exclusive facilities at The Club at Coco Bay and the Beach Club at Playa Ocotal. Make use of the gym, pool, and tennis courts, as well as have access to snorkeling gear and yoga lessons. Let out your inner child on the water slide and play with the available beach toys or just relax and enjoy the peaceful surroundings of this lesser known Guanacaste beach. Buena Onda translates to “good vibes”, with breathtaking views and all the amenities you need. Good vibes are certainly felt at Villa Buena Onda. PLEASE NOTE: Guests minimum age is 16. Breathtaking views of the Pacific Ocean. Two-tier infinity pool with full ocean view, swim-up bar, and various poolside seating options. Inclusive Dining – Enjoy 3 meals per day that are made with fresh, local ingredients to create a fusion of authentic, local cuisine with an international twist. Private Secreto Spa where you can relax and be pampered in luxurious treatments. Golden sand beaches of Hermosa, Ocotal, and Panama are fewer than ten mins away. Concierge service to organize day tours and take care of your every need. Beach shuttle two times a day to local beaches. Complimentary access to the exclusive Beach Club and The Club at Coco Bay. Activities like sportfishing, canopy tours, sailing, scuba diving, a visit to nearby national parks, mud baths and hot springs, Arenal Volcano tours, surfing, and more. Evening options include casinos, bars, and a range of international restaurants.